In Talitha Kumi – The German Evangelical Lutheran school – our mission statement is based on the principles of Christian humanist education and on the fundamental values of peace, freedom, democracy, pluralism, social justice, emancipation, ecological awareness and the establishment of international relations. Talitha Kumi appreciates both the Palestinian and German culture, language and history and tries to establish a harmonious atmosphere of mutual respect and tolerance. We consider this cultural encounter a unique and enriching opportunity of education. This situation enhances intercultural education. Talitha Kumi creates a positive climate that allows everyone to feel comfortable and identify with the school. We advocate equal treatment and appreciation of everyone, taking into consideration individuality. We consider Talitha Kumi a place for integrating students with special needs to be educated according to their abilities and needs within the possibilities so that everyone can develop their potential. We support lifelong learning so that our students can become creative, innovative, open-minded, self-directed and goal-oriented personalities. Thus we provide them with the necessary tools of problem solving, critical thinking and non-violent behavior. We support and encourage our students to pursue their goals on an academic and personal level with determination to succeed in a diverse community. Hence, we offer extra-curricular activities. We work together to provide a stimulating learning environment in which the team of trained staff provide quality teaching through different teaching methods to address the special needs of our students. We educate our students to become national and cosmopolitan citizens by sensitizing them to their own country and other cultures. We encourage exchange programs for our students to participate in the international community and contribute to a better understanding between nations. A major focus of our work lies in the promotion of the German language in both the DIAP and the Tawjihi branch. This can be achieved by supporting students to reach the DIAP and DSD language certificates and preparing students for studying in Germany. We motivate our students to take responsibility for their actions and to contact the mediation team in the event of a conflict. We provide a positive environment in which every student is cared for spiritually, morally, intellectually, socially and emotionally. We commit ourselves – together with our cooperation partners – to achieve the goals of our educational mission. 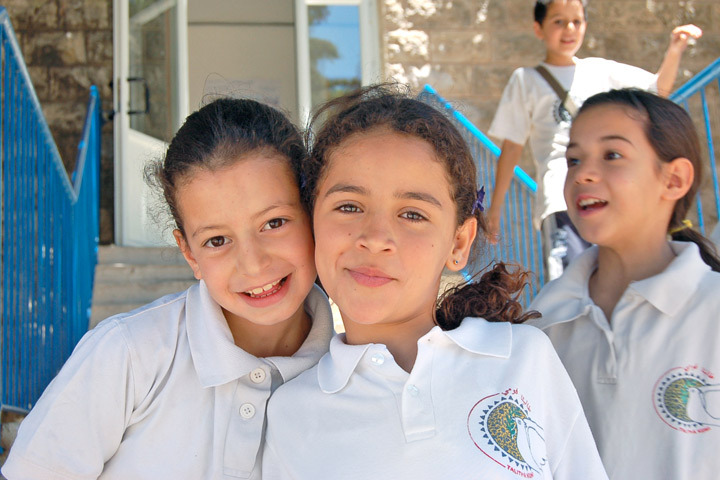 The Educational Centre of Talitha Kumi is located in Beit Jala close to Bethlehem. The school provides classes at all educational levels, from first grade to high school level. Our complex also includes a kindergarten, a vocational training centre preparing trainees for work in the hotel business, a boarding school for girls, as well as a big guest house. Ten kilometers south of Jerusalem, Talitha Kumi was built on a small hill and is surrounded by woods. The school gets its name from the Aramaic language and means „Get up, girl!“ (Mark 5:21-24). This word spoken by Jesus has been our mandate and commission ever since the school was founded in 1851. It is the oldest Protestant school on Palestinian territory. Our guiding principle is the message of peace as proclaimed in the Gospel. Girls and boys in Palestine grow up in a continually stressful environment full of tension and political conflict. Within this context, Talitha Kumi wants to provide a safe place for learning and development.